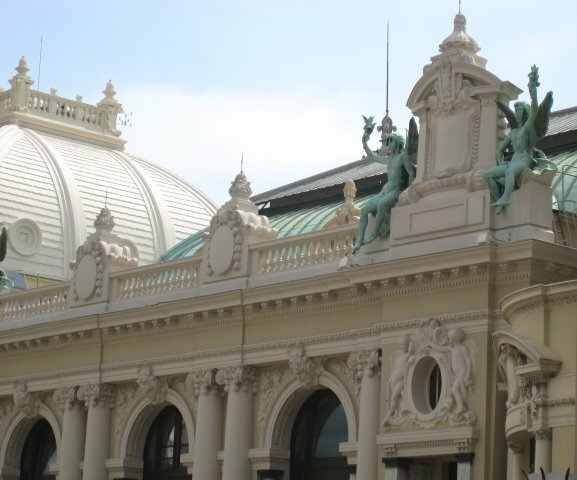 Here's a detail of the famous Monte Carlo casino which was built in 1863. Charles Garnier, the legendary architect of the Paris Opera House, created the casino on a grand scale with its rococo turrets and green copper cupolas. As good a place as any, I suppose, to lose your money! Interestingly, Monaco citizens are forbidden access to the casino, as opposed to visitors and Monaco residents who may enter but must produce a passport or identity card. If you are visiting Monaco, it's well worth the fee to enter the casino and see the amazing gold and marble atrium, the frescoes, bas-reliefs and gold chandeliers. I remember the casino but I didn't go in mainly because when I was there, I had no money and was dressed like a college student (which I was). Great photo and very informative! Thanks! But I was curious to know why Monaco citizens are forbidden accessto the casino?